The Ottawa Hospital: Restructuring now called cutbacks? Last week we were in Ottawa publicly challenging the Champlain Local Health Integration Network to treat service transfers from The Ottawa Hospital as an integration decision. 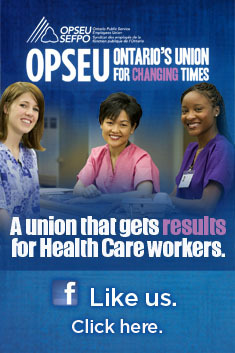 There was a terrific media turnout for the press conference we shared with the Ontario and Canadian Health Coalitions. Following the press conference, one of the local newspapers, the South Ottawa EMC, contacted Champlain LHIN CEO Chantale LeClerc for comment. According to the EMC, LeClerc told them the cutbacks don’t count as an “integration,” so no formal consultation or board decision was required. Up until now the Minister of Health and the LHIN had maintained changes at the hospital were about health care restructuring. Now that health care activists are asking the LHIN to follow process that normally accompanies such restructuring, the changes have become cutbacks after all. The reality is nobody knows what the impact of these cuts or restructuring or whatever-you-want-to-call-it will be. The LHIN could require the hospital to come forward and present its plan. That plan should tell us where the services are being transferred to, what the cost will be, and how it will impact patient access. You might call it health care planning. Instead we have had a litany of excuses as to why such massive cuts to the hospital and potential privatization of services are not being treated in an orderly and transparent fashion. Yesterday we learned of another LHIN that required repeat prompting by the local MPP before they would launch an investigation into a northern hospital that was generating considerable community concern. Is this really how it’s supposed to work? Could the Wynne government do a u-turn on austerity? It didn’t get much coverage in the mainstream media, but last week the big banks told Federal Finance Minister Jim Flaherty to take his foot off the brake when it comes to public sector spending. The banks argue with a weakening economy, now is not the time for restraint. That could mean pushing back Ottawa’s target to wipe out a $26 billion federal budget deficit by $5 billion per year. “You won’t have many economists — or the bond market, which is perhaps a more critical vote — end up criticizing Canada if a couple of years down the road, instead of having a balanced budget, we have a $2 or $3 billion deficit,” CIBC chief economist Avery Shenfeld told the Toronto Star last week. It’s a rare meeting of minds – the same message is being delivered by the Canadian Centre for Policy Alternatives, who argue economic growth is more important right now than the deficit. Private sector economists are predicting economic growth in Canada will slow to 1.5 per cent for 2013. If the economists left and right are telling Flaherty this, then Ontario’s Wynne government must be receiving the same message. This is important — if the provinces and the federal government are rowing in opposite directions, their initiatives would likely cancel each other out. You can also bet that new Ontario finance Minister Charles Sousa – who emerged from the world of banking – is also listening to his former colleagues. There is little question that a provincial freeze in base hospital operating funding is motivating the present shedding of staff positions and services across the province. Hospitals are required to balance their budgets by law, but Local Health Integration Networks regularly extend exemptions conditional on the hospital following an improvement plan worked out between the LHIN and the hospital. Hospital CEOs and LHIN officials are usually reluctant to admit that significant budget cuts will impact service delivery, even if the impact is obvious in examples where hundreds of staff positions are lost (ie. Peterborough Regional). That’s because significant changes in service delivery should be treated as an integration decision, a 60-day process that puts on the onus on the service provider(s) to make a case for change in delivery to the LHIN. That case usually includes evidence of community consultation. With the latest round of hospital cuts the Health Minister and Premier are suggesting what is taking place is not belt tightening, but restructuring. If that is the case, then why not have the LHINs treat these changes as integration decisions where all the facts are put on the table and the community is consulted? The Local Health Integration Networks were initially set up to involve communities in the decision-making process around delivery of regional health care. We have witnessed health care providers, such as hospitals, coming forward to the LHINs with proposals to shift services, identifying how they engaged stakeholders in the planning process before coming forward with a plan for integration. Recently we contacted the Champlain LHIN to ask if the same process is applying to the recently announced changes to service at The Ottawa Hospital, including the so-called “transfer” of endoscopies and cataract services to unidentified providers within the community. Much to our surprise CEO Chantale LeClerc replied that no integration is triggered because the hospital was making these changes under the terms of its accountability agreement. The Champlain Local Health Integration Network has confirmed Chantale LeClerc as its permanent CEO. LeClerc had been serving as interim CEO upon the departure of Alex Munter, who left six months ago to serve as CEO of the Children’s Hospital of Eastern Ontario. LeClerc, a former nurse, has been with the LHIN since 2008. Prior to stepping into Munter’s shoes, she was senior director of health system integration. LeClerc has impressive credentials, including graduating from a management program for nursing executives at the University of Pennsylvania’s Wharton School. LeClerc is the third CEO of the Champlain LHIN since it was created in 2005. Of the 14 LHINs, only three have their original CEOs – Erie St. Clair (Gary Switzer), Central West (Mimi Low-Young) and South East (Paul Huras). The Drummond Commission for Public Sector reform recommended a wage increase for LHIN CEOs given the turnover of senior management, many leaving for hospital jobs. According to the Ottawa Citizen, Ms. Leclerc will earn about $249,000 this year.